After Prime Minister Shinzo Abe’s bilateral summit with Prime Minister Narendra Modi on December 12, the two leaders announced a joint statement. India, as a non-signatory to the Non-Proliferation Treaty has carried out nuclear testing twice, and is currently aiming to increase its nuclear weapons arsenal. Based on this consensus on the bilateral agreement, Japan as a nation that experienced the atomic bombing of Hiroshima and Nagasaki, is positioned to approve India as the world’s sixth official Nuclear Weapons State (NWS). Japan, as a nation that has embraced nuclear non-proliferation as the core of its foreign policy position throughout the seventy years of the postwar era, would thus enact a major policy shift and effectively destroy the global NPT regime. This agreement in principle, will stamp out the efforts toward abolition of nuclear weapons made by many members of international society. Indeed, it completely ignores the “Request for Suspension of Nuclear Cooperation Agreement Negotiations” jointly issued by the Mayors of Hiroshima and Nagasaki, and thus Foreign Minister Kishida has a great responsibility having been elected by the people of Hiroshima Prefecture. Further, as TEPCO’s Fukushima Daiichi Nuclear Power Plant accident remains unresolved and even as many victims continue to suffer, the position of expanding nuclear reactor exports to other nations and therein prolong the life of the nuclear industry is exceedingly unethical. International society continues to severely criticize Japan’s nuclear export policies, especially in light of its abandonment of its own people . In India, in spite of facing the government’s severe repression, local communities have mobilized in broad opposition to the nuclear development plans. 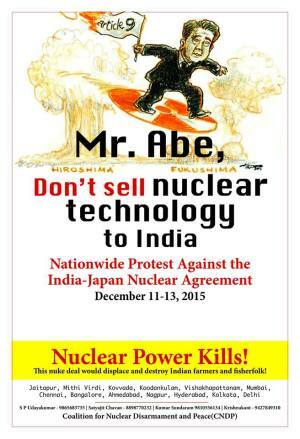 At the same time as this bilateral summit, people across Japan as well as across India, from the capital in New Delhi to sites slated for nuclear power plant construction, as well as global cities such as London and New York, have organized large-scale protests against IJNA and carried out international petition drives. We strongly protest the Abe administration’s “nuclear exports” and “policy shift on the Nuclear Non-Proliferation Treaty” in the name of money-making. We are resolved to continue fighting against this and block the formal signing of the agreement.